Early detection has become a vital line of defense in the California citrus grower’s war with huanglongbing (HLB) disease. Without careful monitoring, any tree in the grove can become a ticking time bomb that could lead to destruction of the entire orchard. The disease starts unnoticed. Many months can pass before a tree displays any visible evidence of the disease. And yet, during that time, a tree could be passing the infection on to other trees in the grove. Only by measuring minute changes in the tree, often using highly technical scientific tools and techniques, can a tree in the early stages of HLB be detected. Figuring out those early detection methods of disease discovery, and finding ways commercial growers can affordably implement them, has been the subject of intensive research around the world. 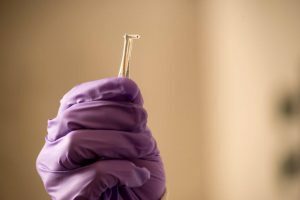 At the University of California (UC), several projects are now underway, and new methods of early detection have been identified. Four methods are still in the research phase of their development, but one detection method has moved from theoretical to useful with two separate modes of implementation. The method that has moved from theoretical to practical involves analyzing the odor of the tree. This familiar but unique odor is comprised of a group of organic hydrocarbon chemicals. This group of chemicals changes if HLB is present in the tree. Recognizing that change is the secret behind this method of early HLB detection. Research in the laboratory of Johan Leveau in the Department of Plant Pathology at UC Davis found that microbial communities living on the surface of citrus tree leaves change during infection. Leveau’s team collects microbes from foliage by swabbing leaves, uses DNA-based methods to profile the bacteria and fungi that are present on the swab sample, and compares the profiles of infected and uninfected trees. Starch accumulation in infected leaves is used as an early indication of disease in citrus. The starch is detected with a camera that uses the properties of light to find it. Starch rotates the polarization plane of light. The sensor uses a polarizing filter to visually detect patterns of starch deposition. The UC Davis research is being led by Alireza Pourreza in the Department of Biological and Agricultural Engineering. Metabolism is the activity an organism carries out in order to stay alive. Research is examining the metabolic changes that occur when a plant is becoming infected. During infection, an organism’s metabolism is busy responding to the pathogen, as it works to protect itself. The metabolite profile is different for healthy versus infected organisms. Carolyn Slupsky is developing methods to measure metabolite profiles of citrus trees, and to identify one that indicates early Candidatus Liberibacter asiaticus (CLas), the bacteria that causes HLB infection. The response to CLas occurs throughout the plant soon after infection, even before symptoms of HLB appear in leaves, twigs, fruit or roots. The changes in metabolite composition can be measured and used to identify infected trees. Slupsky’s lab uses spectroscopy to measure these changes in metabolites. UC researcher Wenbo Ma and her collaborators are researching an approach using antibodies for early detection of HLB. The method detects chemicals which are released into the tree’s phloem flow via the vascular conducting tissue. Slupsky’s lab identifies molecules that are released into the phloem early in the infection process. These molecules, which are very small, spread throughout the tree with the phloem flow, where they are detected using an immunological method. Citrus trees have a wonderful aroma, and that aroma is one key to identify trees infected with HLB. A tree’s scent changes slightly when it is infected with HLB. The change is so slight that a human nose cannot detect it. A grower can use this tiny device to collect volatile organic compounds (VOCs) in a citrus tree. The VOCs are then tested in a lab to determine if HLB is present in the tree. Recently, a UC professor found a way to scientifically analyze scent to identify HLB-infected trees. Odor is created by a group of volatile organic hydrocarbon compounds, or VOCs. Citrus trees emit VOCs as the end products of plant metabolism. As previously reported in the February 2018 issue of Citrus Industry magazine, a team led by UC Professor Cristina Davis has developed a device that anyone can use to collect a sample of the odor. The device is analyzed for the signature VOCs. A specific group of compounds will be present if the tree is infected with HLB, even if it is in the very early stages of the disease. The process for the grower is simple, according to Davis. Growers can contact XTB Laboratories (www.xtblabs.com) to request a test kit. The kit is a collection device that the grower places in a tree before shipping it back to the lab for testing. The lab will have an answer for the grower within a matter of days. The second method for VOC collection uses canines. A Florida dog trainer, Pepe Peruyero, has been working since 1999 to teach canines to identify the smell of HLB and citrus canker. Dogs trained by Peruyero in Gainesville at his J & K Canine Academy (www.jkk9.com) have sniffed citrus diseases with accuracy rates as high as 98 to 99 percent. His dogs participated in highly successful research projects, funded by J & K and overseen by Tim Gottwald, a U.S. Department of Agriculture researcher in Florida. 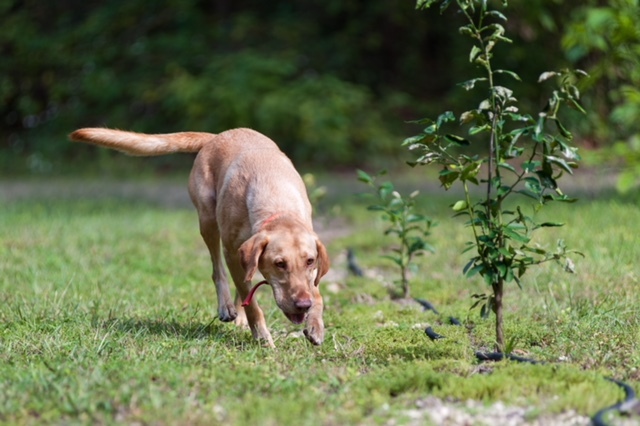 Peruyero noted that despite the success of the dog detector method, the rapidly increasing presence of HLB in Florida groves became a problem. Detector dogs trained in Florida by F1 Kennels will be used in California soon, according to Gary Schulz, president of the California Citrus Research Board. “We are interested in bringing the dogs to California for a long-term basis,” he said. Two separate studies have been funded to evaluate the dogs’ work. Gottwald will oversee the dog tests in California. Meetings are underway to create the project and a project manager is being selected. Len Wilcox is a retired scientist who ran a weekly newspaper and has written for agricultural publications since the 1980s. His commentary, “The Western View,” is a regular feature on the AgNet West Radio Network.